We are recognized as leading supplier and manufacturer of Packaging Roll Stocks. 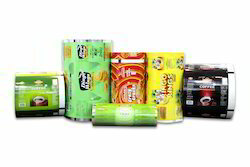 Our product range also comprises of Food Packaging Pouches, Stand Up Pouches and Sealed Pouches. We manufacture these Packaging Roll Stock using premium quality material. We do offer roll stock to the customer who wants to pack their products on their own machines. The rolls we are supply strictly as per the requirements of the product as well machines used to pack the products. We do study the requirements of the machines to be used to pack the product before cylinder making so as the design do not get disturb after pouch filling and sealing. We do take up most care in packing the roll stocks so as it does not get damage during transportation.